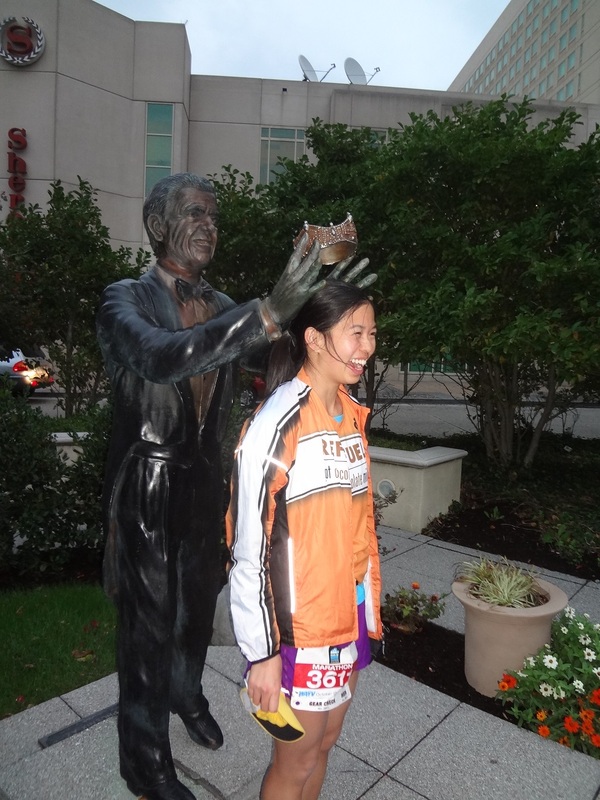 Windy Atlantic City Marathon, the 1st Cupcake Run and Giveaway Winner! Is it really December already?? I had such a busy fall race season that I have barely had time to process the fact that I have run 2 marathons, a half-marathon and an ultra in only 2 months. Fall is my favorite time of year for running, because there are so many fun races to choose from! Jessica W. from New York, NY! Congratulations!! Thanks to all the participants for entering! Remember, tickets are still available for purchase here or at the Symphony Space box office. 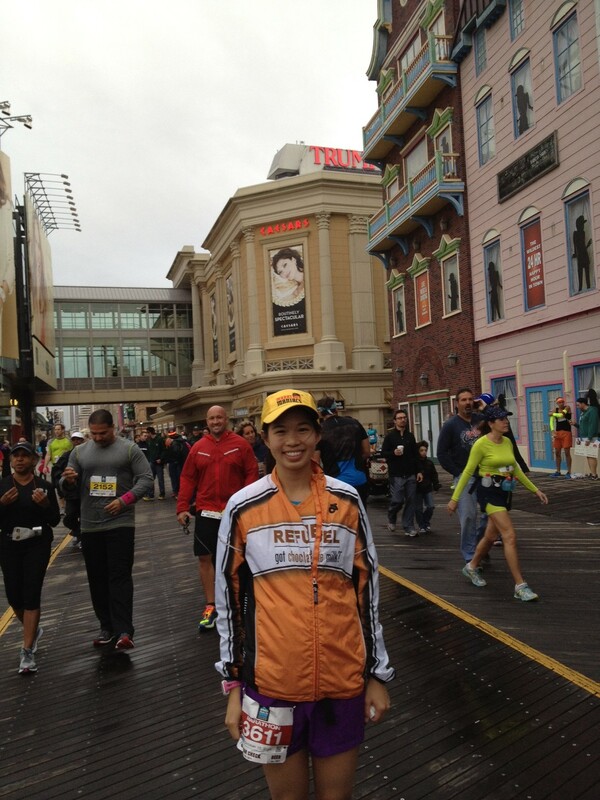 On Sunday, 10/13/13, I ran the Atlantic City Marathon. I had signed up for it almost a year in advance because of an amazing deal that I found on a deal site named Schwaggle.com. Ironically, the site doesn’t exist anymore (it was run by Active.com), but I was able to redeem my voucher for a $32 Atlantic City Marathon entry. Sweet! I was looking forward to finally checking off New Jersey on my 50-states marathon list. I had just run the Brooklyn 10K at hard effort the day before, worked, then hopped on a bus. My Marathon Maniac friends Sandy and Scot were kind enough to pick up my race packet, making it possible for me to do this race. Thanks Sandy and Scot! The Sheraton had a great display of historical Miss America pageant artifacts. There were gowns, crowns, scepters, trophies, and even a statue! The statue, Bert Parks, was of the original Master of Ceremonies of the Miss America pageant, and Scot and Sandy urged me to stand under the crown held in the statue’s hands. The picture says it all. The tune of “Here she is…Miss America” started playing when I stood under the crown! It was magical. I stayed at the Sheraton just a short walk from the start line. The half-marathon and marathon starts were at the same time, and runners lined up excitedly on the boardwalk in front of Bally’s Casino. It was gray and windy, but at least the drizzling rain stopped before the race went off. I wore my Team Refuel jacket and it kept me warm through the crazy winds coming up over the boardwalk. 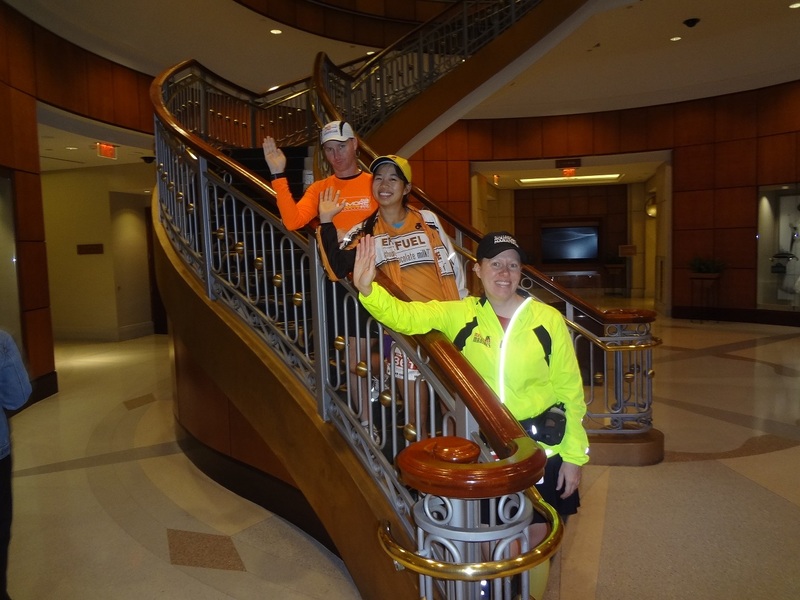 The race started and we ran through some back highways to various casinos, such as Harrah’s and the Borgata. The weather was not that cold, fortunately, but it was windy practically the whole time. It was one of the most challenging weather conditions I ever ran in; since we were next to the beach most of the time, sand blew into my eyes and my mouth whenever I took a breath. I used my hands to cover my face at times! The volunteers were so cheery and fantastic. It must have been miserable for them to stand in that wind for hours on end, but they were so encouraging to all the runners. There were high school students and also senior citizens volunteering. Young and old alike, they encouraged us on a day that I really needed it! I had initially wanted to run a 4:45, but the challenging conditions made a sub-5:00 hour marathon more reasonable. With my hand over my mouth at times (to keep the sand out) and my eyes squinting from the sun and the sand, I managed to finish in 4:55:23. It was definitely a result to be proud of in tough windy (25mph wind) conditions. At the finish line, I congratulated my Dashing Whippets teammate Simon on his race, and we took a photo together. The post-race festival was pretty nice, and it had some good non-traditional post-race food. There were bagels, bananas, Honest Tea, but also clam chowder from a local restaurant, beer, and even kettle corn! My favorite was actually the clam chowder–it sounds weird, but I love soups after a race! A friend and I went to the Borgata buffet to celebrate afterward, and it was awesome. I piled on the soup, meat, pasta, and gelato afterward. Then, it was a long bus ride back to the city. I met up with Heather and Shane for a delicious post-race dinner at Mission Chinese Food on the Lower East Side. We ordered Egg Egg Noodles, some pork fried rice, veggies, and my favorite, the Thrice-Cooked Bacon. It is a fiery dish and I had it almost a year ago so I was due for a repeat! It was an amazing dinner. Thanks for celebrating with me, Heather and Shane! 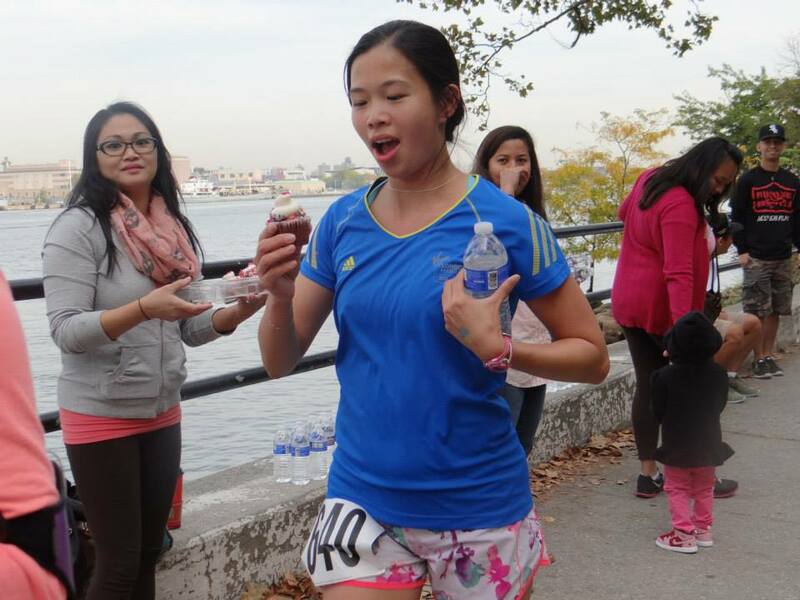 On Saturday, October 19, I ran the first-ever NYC Cupcake Run! I signed up for it on a whim, but I had competed in the 2011 NYC Pizza Run and enjoyed myself. It was put on by the same organizer, Jason, who runs the blog I Dream of Pizza . Personally, I also wanted to have a cool Cupcake Run t-shirt, so that was another incentive. I was pleasantly surprised when I saw my friends Fanny and Henry running too! It was held in Astoria Park and the distance was 5k. So how do you run a cupcake race? 1) You must eat 3 cupcakes at designated spots on the course (1 per stop). 2) You are allowed a bottle of water, but you must consume the entire cupcake (you can still be chewing) before you leave the station. There were prizes for the top finishers and each participant got a cupcake goody bag, access to the after party at Rocky McBride’s, and a t-shirt. The race sold out early so I was lucky to have registered early. Shane came with me to the race and did a workout and took some pictures while I ran/ate. It was my first time in Astoria Park (Queens) and I was pleasantly surprised by the nice river views. There was an informal pre-race meeting held by Jason, and then we were off! I lined up near the front because I wanted to be somewhat competitive (it’s the ultrarunner in me). We came to the first cupcake and it was vanilla cake with vanilla icing. Yummy! I gobbled the cupcake in four bites and washed it down with water. This wasn’t so bad! I ran hard the whole time and encouraged Fanny and Henry whenever I saw them. We kind of smiled and nodded at each other at the absurdity of what we were doing. The second station was a red velvet cupcake. The cupcakes were from Sweets First, and I’m sure they would have been delicious in normal circumstances (not during the race) but the red velvet flavor made me want to hurl when I tried to eat too fast. I drank water and ran while I still had bites of cupcake in my mouth and moved on. Finally, the third station had a S’mores cupcake with marshmallow topping. This was one of my favorites. It was getting down to the wire and I could hear the spectators cheering loudly. I was almost done! I crossed the finish line in 25:51:00, in 13th place out of 145 eventual finishers. I was so glad to be done. I drank water and really wanted a stick of gum to get the taste of three cupcake flavors out of my mouth. It was cool once I realized that I just set a PR (personal record) for a cupcake run! I saw a guy running in a birthday hat, and we chatted at the race finish. Turns out, it was his real birthday, and he had placed second! It was well-deserved–a cupcake 5k is pretty tough. I’m proud to wear my hard-earned finisher shirt. Thanks to Jason and all the sponsors for putting on a really fun, unique race. I’ll be back! 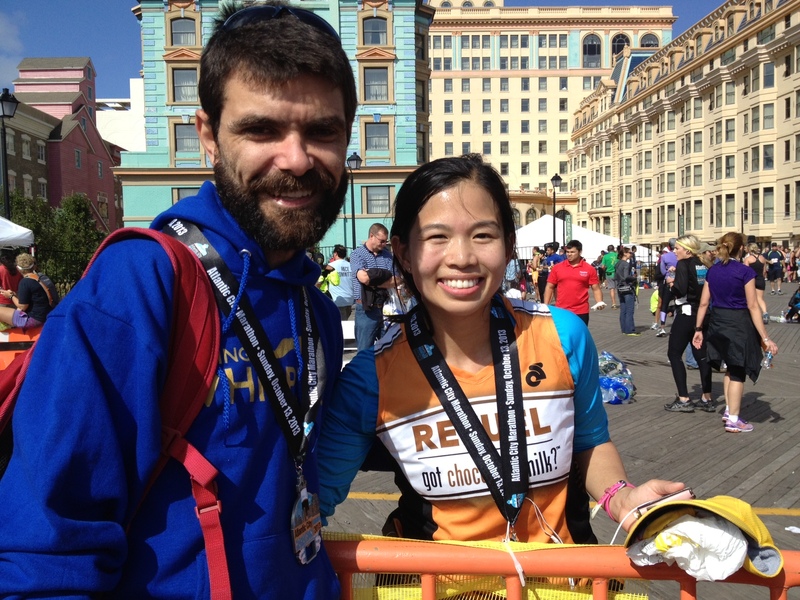 Categories: Uncategorized | Tags: Atlantic City Marathon, Borgata buffet, Cupcake Run, giveaway, I dream of Pizza, In the High Country, marathons, Mission Chinese Food, Porcupine Product, Sweets First | Permalink. 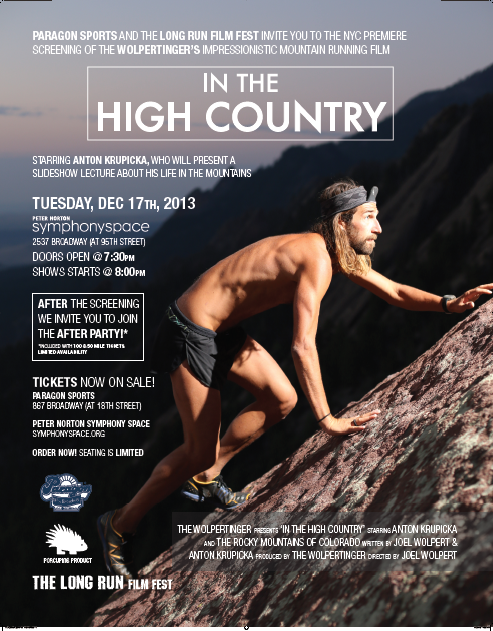 *Giveaway* Enter to win two tickets to the NYC Premiere of “In the High Country” with Anton Krupicka! Prize courtesy of Will at Porcupine Product. Many thanks! featuring food from local chefs and craft beer. You will gain one entry point (up to a maximum of 6 entry points) by doing the following and listing in the comments the points you have earned. You do not have to complete all 6 steps–you just have to do at least one to be entered! The more points you have, the more chances you have to win! BE SURE to list what you have done in the comments so I can give you credit! Winner will be chosen by a random number generator on Random.org. Share this giveaway with your friends! Be sure to check your email and this blog at 8:00pm on Sunday, 12/15/13 to see if you won! Good luck and thanks for participating! Winner will be chosen at 8:00pm on Sunday, 12/15/13 and will be notified by email and announced on this blog. Winner must claim prize via email by 12:00pm on 12/16/13 or an alternate winner will be selected. Must be 21+ to attend the after party. No substitutions/mailing of prizes. Prize must be claimed at the Symphony Space box office in NYC on 12/17/13. Winner must be available to attend the event on 12/17/13 at 8:00pm or an alternate winner will be chosen. Airfare/travel/accommodations not included. Approximate retail value of prizes (ARV): $84. Categories: Uncategorized | Tags: Anton Krupicka, giveaway, In the High Country, NYC, Porcupine Product, Symphony Space, Ultrarunning | Permalink.